Peanut butter is a staple food for me. I love it's taste, texture, and smell. “Man cannot live by bread alone,” my mother would say. “He has to have peanut butter.” Now that I'm grown, I've become a bit of a peanut butter connoisseur. We don't buy any old peanut butter around this house. Oh, no. We buy the natural stuff that you've got to stir up when you get home. It's more expensive, but it's much better tasting, and better for you, than that no-stir crap that has hydrogenated vegetable oils mixed in with it. 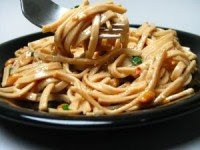 One of my favorite pasta dishes, and a favorite of my children as well, is spaghetti with peanut butter sauce. Yep! Peanut butter pasta. The first time I saw this recipe was in Jeff Smith's “Frugal Gourmet Whole Family Cookbook.” I loved the “Froog.” As a young man, I watched “The Frugal Gourmet” on PBS religiously. It's only natural that I picked up a thing or two from him. As always, I've modified this recipe to fit my own tastes. It's simple enough that you might just get embarrassed telling anyone about it. Combine peanut butter, hot water, soy sauce, garlic, sesame oil, and cayenne pepper (leave it out if you don't like spicy food) in a small saucepan. over medium-low heat. Stir constantly until hot, smooth, and creamy. Stir in the milk and mix well. Toss with cooked spaghetti and serve, garnished with a bit of parsely. This dish works well for almost any pasta. It almost seems more at home over ramen noodles than spaghetti, probably because the flavors are straight from the Far East. My kids like it best over angel hair pasta. I like serving this dish with a side of corn, seasoned with butter and curry spice, and a tossed salad of lettuce and julienned cucumbers. Many thanks from another Mormon Foodie. Got a good recipe for Cold Sesame Noodles? To paraphrase John Bytheway: I'm drug-free, alcohol-free and peanut-butter free. I hate peanut-butter." Awesome, I'm bookmarking this one right now, so simple and so awesome. I'm gonna ask, no demand, that you submit this to the Peanut Butter Lover's Month roundup I'm having. Look for the submission form at the bottom of this post: Mini Thanksgiving Feast. This sounds so simple yet so delicious. It's on my 'to do' list for the next time I make pasta. I'm always looking for easy, tasty sauces for my pasta which don't include meat. What Pots and Pans Should I Buy?